Do you recognize these women? Investigators from the Vista Sheriff's Station want your help in identifying and locating two suspects wanted in connection with a burglary at a gym in Vista. It happened on January 7th between 5:00 p.m. and 6:00 p.m. at Planet Fitness located in the 1900 block of University Drive. Investigators say one of the suspects cut the lock off of a locker and took credit cards, cash and a checkbook. 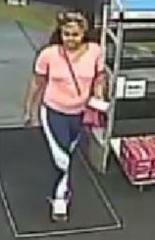 One of those stolen credit cards was used to purchase $1,000 worth of Visa gift cards at Walgreens located in the 300 block of Sycamore Avenue. The two suspects were seen driving to Walgreens in a silver, 4-door Mercedes with no front license plate. Suspect #1 is described as a Black woman with a heavy build. 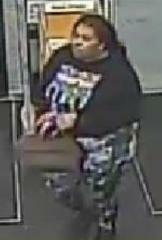 She has long hair and weighs about 220 pounds. She was last seen wearing a black, long sleeved shirt and camouflage leggings. Suspect #2 is described as a Black woman with a medium build. She has long hair and weighs about 140 pounds. She was last seen wearing a pink top with blue and white leggings. 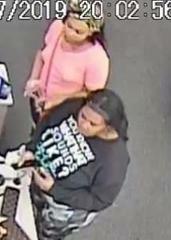 If you know who these women are or have any other information, call Crime Stoppers at (888) 580-8477.